For many people this day is one of the happiest days of their lives. Has that beautiful memory started to tarnish as you keep finding stains on your floors? Have you found yourself arguing with your family about whose fault it is that the dog had an accident...as you blot and scrub disgusting yellow stains on your hands and knees? Are there now moments where you consider "getting rid" of your furry friend in exchange for the days when you didn't have a soiled home and constant stress? Take a moment to reconsider. Look into those puppy dog eyes again and know that this does not need to be your life. You can again find happiness with your cuddly, sweet dog. You can again have a clean home. Millions of people, just like you, struggle with the frustration of an untrained dog. Some of those poeple never find a solution and become so frustrated that they are driven to abandon their former Best Friend to a shelter hoping someone else will be able to handle this impossible animal. Odds are good that those abandoned dogs will never find a home like yours. You deserve a better option. Something easy that is safe for you and your pet. Something that actually works! And fast! Something that works on Day 1 and keeps working until your Best Friend is housebroken and your have your clean home back. At this point you have probably tried everything out there. Maybe you have tried the long list of sprays and cleaners and solutions that promise results but leave you deflated. Did you try all the indoor doggie toilet options (the grass patch, the piddle-pads, the mesh grate thingy) that were all gross and stinky and seemed just an additional place for your dog to soil? Did you try "constant supervision" and grow eyes in the back of our head or crate training only to realize that the very moment your dog is out there is somehow an accident (you only looked away for a split second!)? Did you ask a trainer to help you only to be told that you are somehow a failure - yet they won't guarantee results? Have you been shampooing the carpets over and over agaiin just to find another puddle practically the next day? Does it feel like insanity yet? There now is a REAL solution to housebreak your pet. A real alternative to "getting rid" of your dog without living with indoor soiling (and, no, that solution does not include putting a doggie toilet in your beautiful home!). The proven solution that thousands of people have used to actually prevent indoor peeing AND help housebreak their Best Friend is named The Housebreaker. 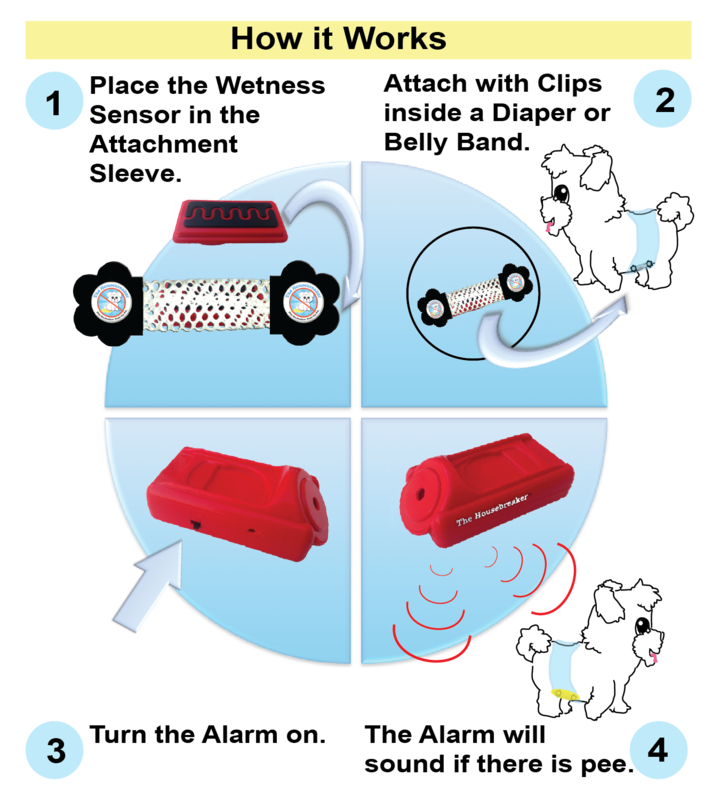 The Housebreaker is extremely safe and will not shock or harm your dog. In fact, it has been tested by the FDA, Canadian Medical Board, and European Medical Board and shown safe enough for humans. The Housebreaker Takes it from there. If your dog tried to soil your home - The Housebreaker will immediately signal the dog's mistake while preventing any accidents from actually occurring in your home. 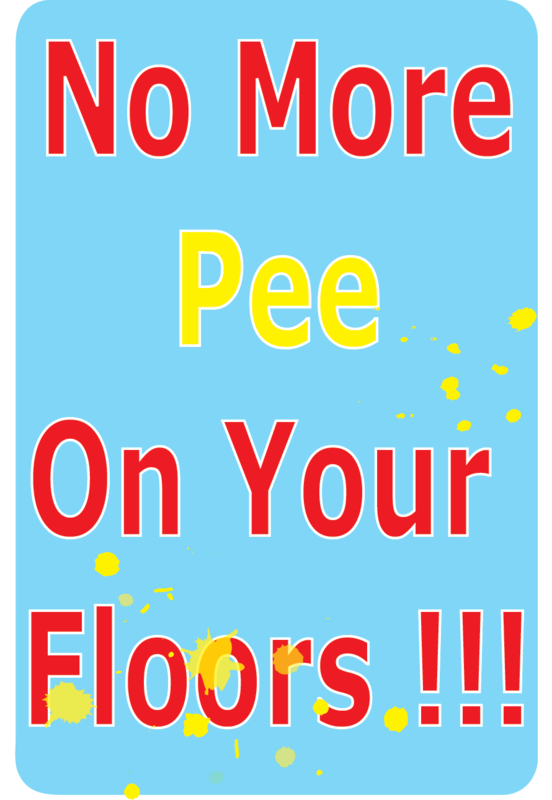 There won't be any pee on your floors or furniture to clean. Many dogs respond so well that they are trained within 1 or 2 days! Imagine how much hassle and stress you could have avoided if you had this option to begin with? Even if your dog isn't a puppy it is NOT too late. Dogs of all ages have been successfully trained using The Housebreaker. 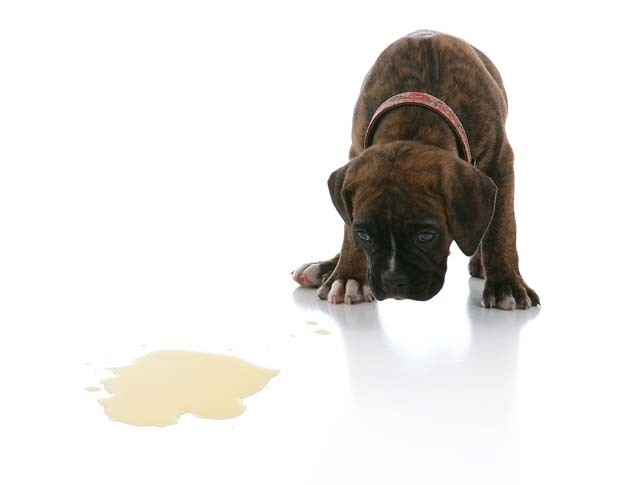 Although some dogs take longer, many dogs have been housebroken to stop peeing in the house within 1 or 2 days! Regardless of how fast the dog responds, The Housebreaker will prevent even a drop of pee from being in your home so you won't have to bother with the messes at all anymore. While using The Housebreaker your dog will be wearing a diaper or belly band indoors but this is TEMPORARY and only when inside. The dog will only wear the garments during the training process - often only a few days. 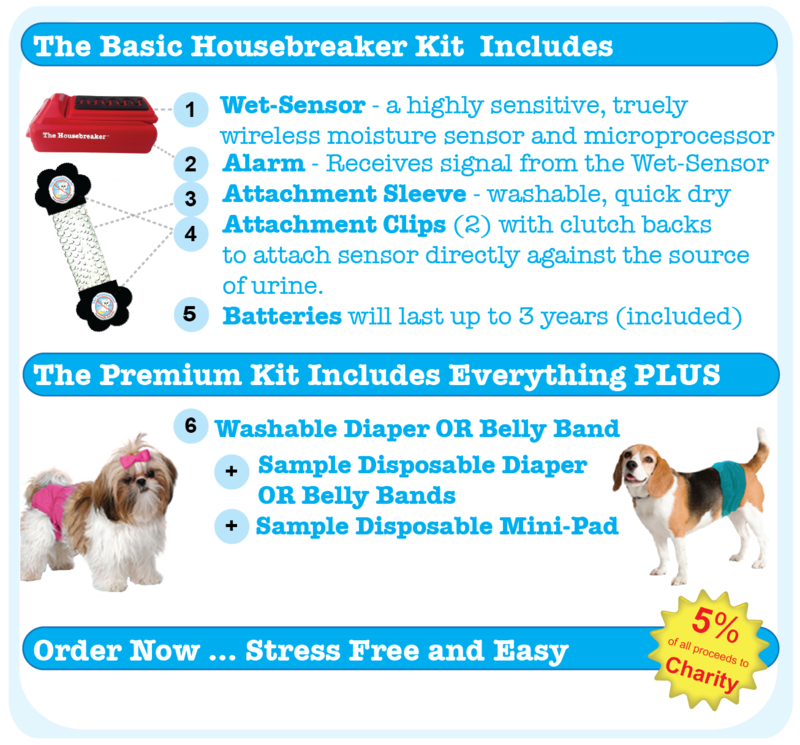 The Housebreaker utilizes a diaper for a female dog OR a belly band for a male dog to (1) catch every drop of pee so it never touches your floors again and (2) to position the Wet-Sensor directly against the urine source to immediately detect any attempts to pee in your home. Ready for a housetrained dog? 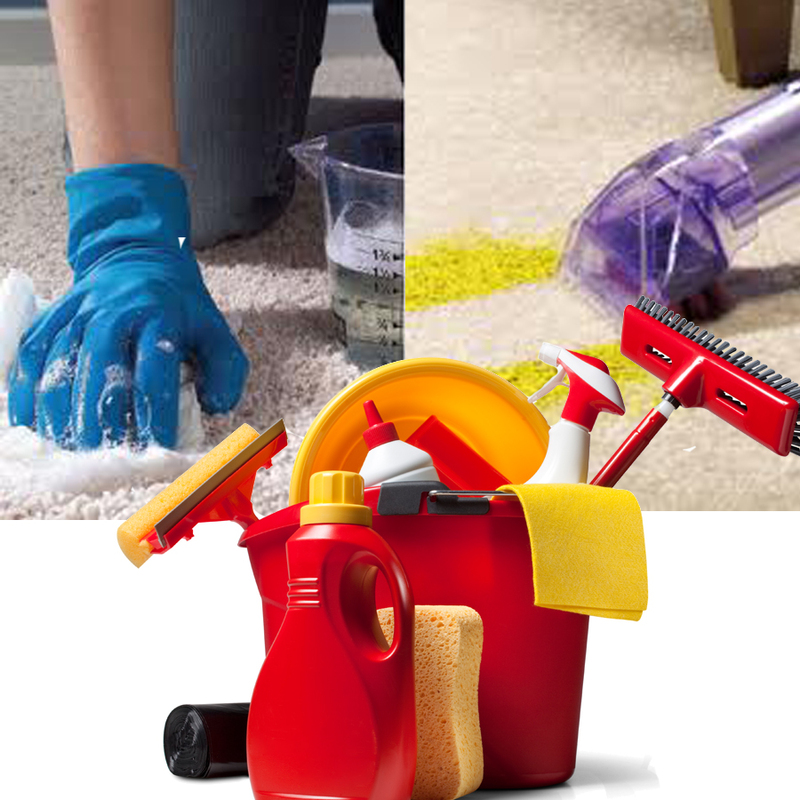 Are you ready to have a clean home? Ready to enjoy the ease and convenience that only The Housebreaker can offer you?